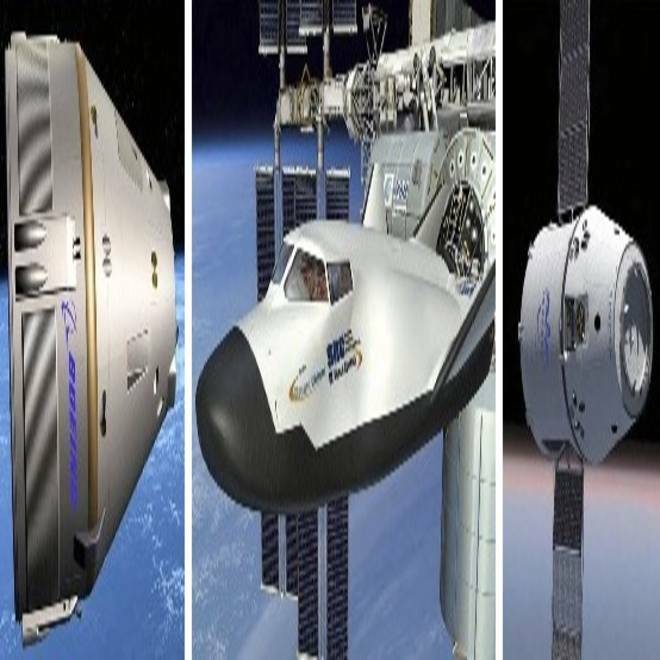 Among the spaceship projects receiving NASA support are Boeing Co.'s CST-100 capsule (left), Sierra Nevada Corp.'s Dream Chaser space plane (middle) and SpaceX's Dragon capsule (right). NASA has committed $1.1 billion over the next 21 months to support spaceship development efforts by the Boeing Co., SpaceX and Sierra Nevada Corp., with the aim of having American astronauts flying once more on American spacecraft within five years. The lineup of companies matches what sources told NBC News on Thursday, but today NASA laid out the details, including the outlays for each of the teams involved. The space agency is setting aside $460 million for Boeing, $440 million for SpaceX and $212.5 million for Sierra Nevada. The next phase of NASA's commercial spaceflight effort — known as Commercial Crew Integrated Capability, or CCiCap — calls for these three companies to take their design and testing program through a series of milestones by May 2014. Optional milestones could lead to crewed demonstration flights in later years. NASA Administrator Charles Bolden told reporters that the space taxi program "is a top priority of the Obama administration." In the wake of last year's retirement of the shuttle fleet, the space agency has had to depend on the Russians to fly American astronauts at a cost of roughly $60 milllion a seat. Bolden said the move to U.S. commercial transport would guarantee "that we never find ourselves in the situation where we find ourselves today," at the mercy of a sole provider. Flying crew by 2015, 2016, 2017? This is actually the third phase of NASA's Commercial Crew Program. All three companies have received NASA support adding up to hundreds of millions of dollars during earlier phases. Boeing is working on a capsule called the CST-100, SpaceX is upgrading its Dragon capsule to be capable of flying astronauts safely, and Sierra Nevada is testing its Dream Chaser space plane, which looks like a miniaturized version of the space shuttle. NASA video focuses on Boeing's CST-100 crew vehicle. NASA video presents scenes from a crewed SpaceX Dragon mission. NASA video highlights Sierra Nevada's Dream Chaser space plane. The CST-100 and Dream Chaser would be sent into orbit on United Launch Alliance's Atlas 5 rocket, while SpaceX would launch the crew-capable Dragon on its own Falcon 9 rocket. The Dragon and Falcon 9 are already being used for robotic cargo resupply missions to the space station. The three companies say their spacecraft will be capable of flying seven astronauts to the space station, at a per-seat cost that's less than what NASA is paying the Russians. NASA and congressional leaders made a deal that called for two commercial partners to receive full funding, with one additional backup partner receiving half funding. That would imply that Sierra Nevada Corp. is the halfway partner, but Mark Sirangelo, chairman of SNC Space Systems, said he didn't see it that way. "We're very happy with the award," Sirangelo told me. "Obviously more money would have been great." He said NASA's funding, plus Sierra Nevada's own resources, would keep the program on track for the start of operations in 2016 or 2017. Sierra Nevada's milestones stop just short of a critical design review, while SpaceX and Boeing could be funded through that phase. In a statement, Elon Musk, SpaceX's billionaire founder, CEO and chief designer, hailed the CCiCap award as "a decisive milestone in human spaceflight" that would set "an exciting course for the next phase of American space exploration." "SpaceX, along with our partners at NASA, will continue to push the boundaries of space technology to develop the safest, most advanced crew vehicle ever flown," Musk said. Boeing also welcomed today's announcement. "Today’s award demonstrates NASA's confidence in Boeing's approach to provide commercial crew transportation services for the ISS," John Elbon, Boeing vice president and general manager of space exploration, said in a statement. "It is essential for the ISS and the nation that we have adequate funding to move at a rapid pace toward operations so the United States does not continue its dependence on a single system for human access to the ISS." SpaceX projects being able to launch a crewed demonstration flight in 2015, and Boeing anticipates achieving that feat by late 2016, said Phil McAlister, director of NASA's commercial spaceflight development program. However, he said those timetables come with a "big asterisk": optimal funding from NASA, which McAlister said almost never happens. Musk told me that the 2015 demonstration flight would go into orbit, but not to the space station. He estimated that the first space station flight could take place a year later. Getting to that point would require NASA funding to the tune of $1 billion, he said — which implies that SpaceX would be roughly halfway there with the CCiCap funding. A PDF file from NASA summarizes the details for the CCiCap agreements. Four other companies submitted proposals for CCiCap funding, said Bill Gerstenmaier, NASA's associate administrator for human exploration and operations. Three of the also-rans — Space Operations, American Aerospace and Space Design — didn't meet the requirements for consideration, he said. The fourth company was ATK, which has been working with Lockheed Martin and Astrium on the Liberty launch system. ATK has said that it will continue work on Liberty, which would use adapted versions of the space shuttle's solid rocket booster and a second stage from Astrium's Ariane 5 rocket. But without NASA support, the pace of development would be slower. Gerstenmaier said ATK's development plan didn't come up to the level of the three companies that were selected, but held off on providing details about the decision process. "The stronger proposals were really the three that we talked about," he said. Additional companies could negotiate unfunded agreements for NASA's advice, McAlister said. ATK and two other companies, United Launch Alliance and Excalibur Almaz, had such agreements during earlier phases of the commercial crew program. Another company, Blue Origin, has been received NASA funding for the development of its orbital space vehicle but did not apply for continued CCiCap support. NASA says the reliance on commercial transport to low Earth orbit would free up the space agency to concentrate on exploration beyond Earth orbit. "For 50 years American industry has helped NASA push boundaries, enabling us to live, work and learn in the unique environment of microgravity and low Earth orbit," Gerstenmaier said in a statement. "The benefits to humanity from these endeavors are incalculable. We're counting on the creativity of industry to provide the next generation of transportation to low Earth orbit and expand human presence, making space accessible and open for business." NASA is spending billions of dollars to develop the Orion multipurpose crew vehicle for deep-space exploration, as well as a heavy-lift rocket known as the Space Launch System. Those spacecraft are being designed to send astronauts to a near-Earth asteroid by 2025, and to Mars and its moons in the 2030s.